A stand of garden chives planted in the ground or growing in a container provides a lift to spring cookery. The mild onion-like flavor and tender texture. Schoenoprasm roughly translates to grassy leek or sedge leek. It is the slender foliage that can over mingle with weed grasses that leads me to grow it in a container. It is an attractive plant in late spring with the fresh outspread foliage. Our chives are just beginning to show buds and here are a few suggestions on how to use and care for chives. When blooms open cut the tough flower stem all the way to the base. Give the flower head a sharp twist off the stem and it will break into a handful of lavender pink florets. These are delicious and beautiful scattered over a green salad, an omelet, baked potatoes, fresh fish, and more. 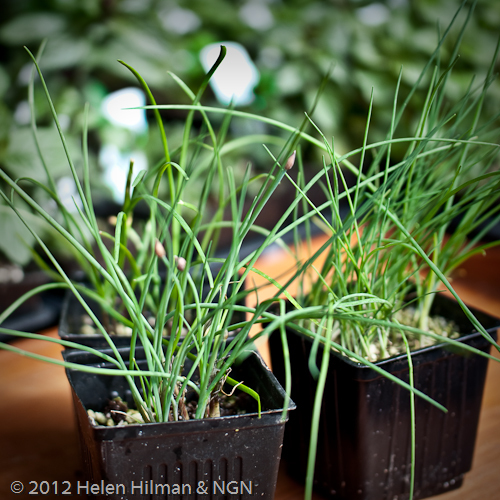 The chives will produce all summer and benefit from regular light fertilizing. To harvest, determine how many stems you need and cut to the base and they will sprout new shoots. If you only cut half way down, the stubby stems will reproachfully sit and slowly turn brown at the tips. Chives when provided six hours of sun a day, fertilizer and moisture grow vigorously and are best divided in late summer or early fall. Dig the clump from the ground or remove from container with a few taps and a tug. The simplest way to divide is drop the plant from about 15″ and roll to loosen the bulb clusters. These can be transplanted into assorted containers or planted in the ground. I recommend working about a tablespoon of bonemeal per pot or cluster when replanting. Plant several small clumps together so you have a strong planting come next spring. This summer keep your plants fertilized, my usual preference is liquid seaweed, Sea Magic or Maxi Crop and a rounded teaspoon of bonemeal scratched into the soil per plant for established plantings. Chives are tolerant of some shade. Chive varieties recommended for greenhouses have a stouter stem and tolerate reduced light without becoming floppy.